I test out a fast and very wide lens designed specifically for Sony mirrorless cameras. 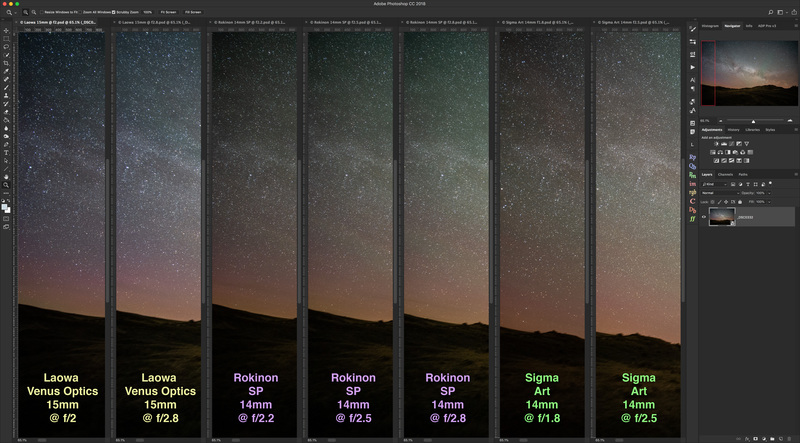 In a previous test I presented results on how well the Sony a7III mirrorless camera performs for nightscape and deep-sky photography. It works very well indeed. But what about lenses for the Sony? 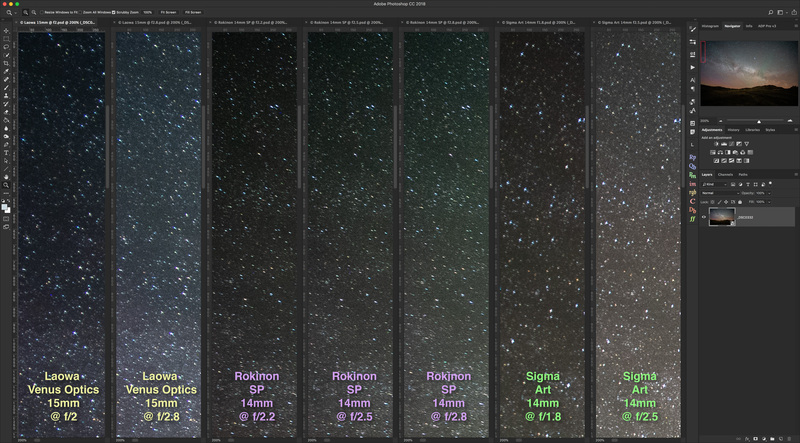 Here’s one ideal for astrophotography. I use it a lot and highly recommend it. While I often use the a7III with my Canon lenses by way of a Metabones adapter, the Sony really comes into its own when matched to a “native” lens made for the Sony e-mount. The selection of fast, wide lenses from Sony itself is limited, with the new Sony 24mm G-Master a popular favourite (I have yet to try it). However, for much of my nightscape shooting, and certainly for auroras, I prefer lenses even wider than 24mm, and the faster the better. Aurora over Båtsfjord, Norway. This is a single 0.8-second exposure at f/2 with the 15mm Venus Optics lens and Sony a7III at ISO 1600. The Laowa 15mm f/2 from Venus Optics fills the bill very nicely, providing excellent speed in a compact lens. While wide, the Laowa is a rectilinear lens providing straight horizons even when aimed up, as shown above. This is not a fish-eye lens. The Venus Optics 15mm realizes the potential of mirrorless cameras and their short flange distance that allows the design of fast, wide lenses without massive bulk. 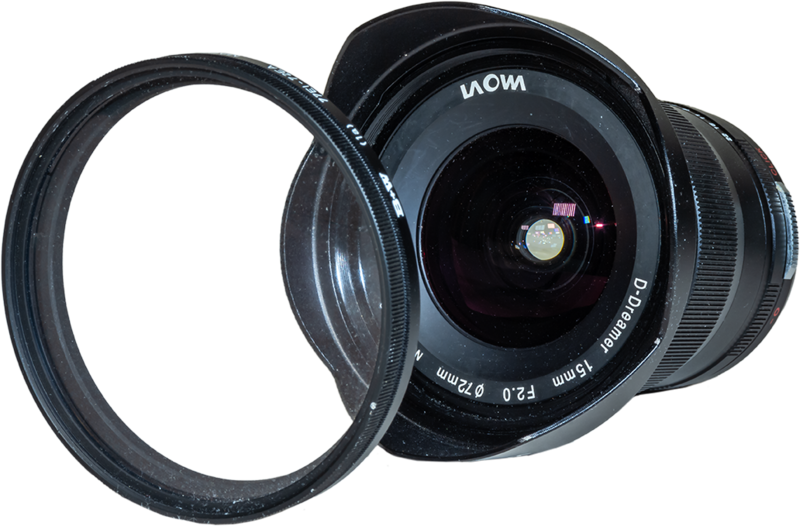 While compact, at 600 grams the Laowa 15mm is quite hefty for its size due to its solid metal construction. Nevertheless, it is half the weight of the massive 1250-gram Sigma 14mm f/1.8 Art. The Laowa is not a plastic entry-level lens, nor is it cheap, at $850 from U.S. sources. However, this is a no-frills manual focus lens. Nor does it even transfer aperture data to the camera, which is a pity. There are no electrical connections between the lens and camera. However, for nightscape work where all settings are adjusted manually, the Venus Optics 15mm works just fine. The key factor is how good are the optics. I’m happy to report that they are very good indeed. To test the Venus Optics lens I shot “same night” images, all tracked, with the Sigma 14mm f/1.8 Art lens, at left, and the Rokinon 14mm SP (labeled as being f/2.4, at right). 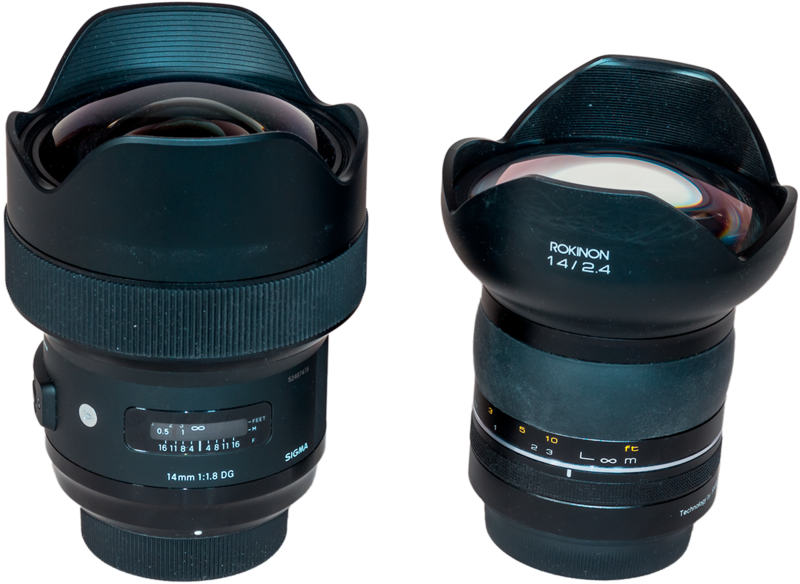 Both are much larger lenses, made for DSLRs, with bulbous front elements not able to accept filters. But they are both superb lenses. 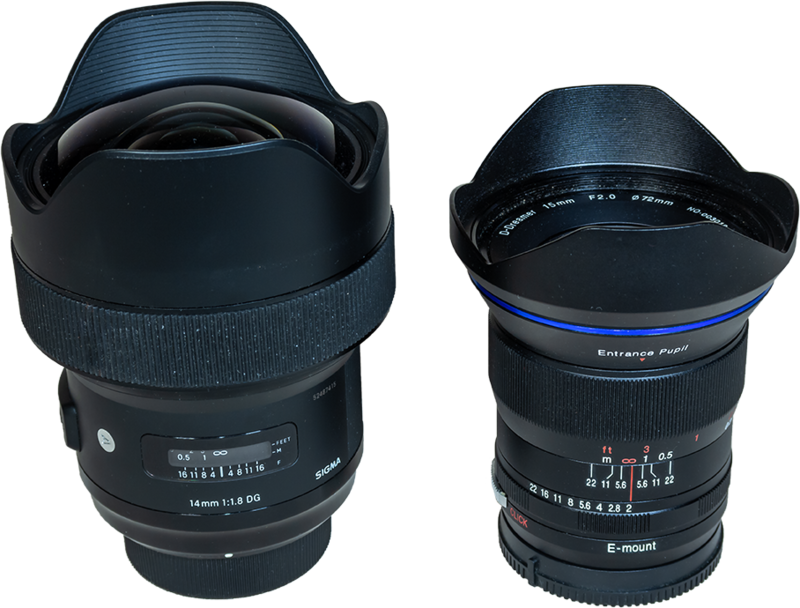 See my test report on these lenses published in 2018. 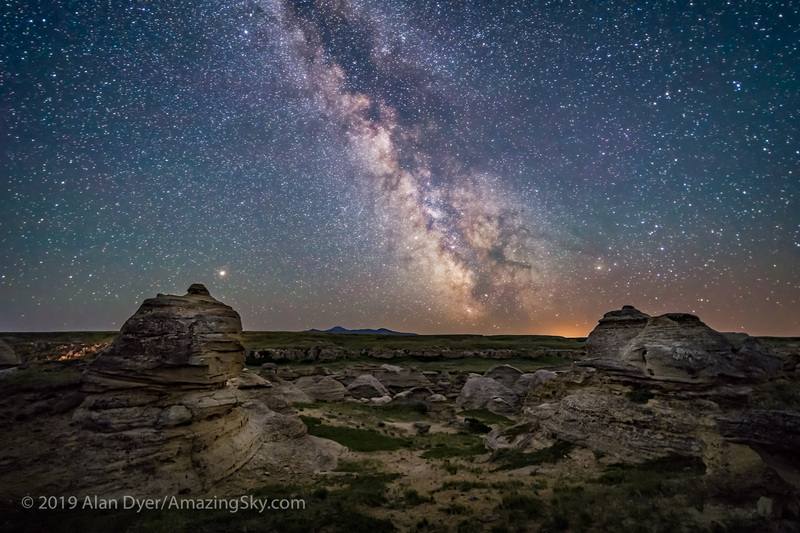 The next images show blow-ups of the same scene (the nightscape shown in full below, taken at Dinosaur Provincial Park, Alberta), and all taken on a tracker. I used the Rokinon on the Sony a7III using the Metabones adapter which, unlike some brands of lens adapters, does not compromise the optical quality of the lens by shifting its focal position. But lacking a lens adapter for Nikon-to-Sony at the time of testing, I used the Nikon-mount Sigma lens on a Nikon D750, a DSLR camera with nearly identical sensor specs to the Sony. A tracked image with the Venus Optics Laowa 15mm at f/2. Click or tap on an image to download a full-resolution JPG for closer inspection. Above is a tracked image (so the stars are not trailed, which would make it hard to tell aberrations from trails), taken wide open at f/2. No lens correction has been applied so the vignetting (the darkening of the frame corners) is as the lens provides. As shown above, when used wide open at f/2 vignetting is significant, but not much more so than with competitive lenses with much larger lenses, as I compare below. And the vignetting is correctable in processing. Adobe Camera Raw and Lightroom have this lens in their lens profile database. That’s not the case with current versions (as of April 2019) of other raw developers such as DxO PhotoLab, ON1 Photo RAW, and Raw Therapee where vignetting corrections have to be dialled in manually by eye. A tracked image with the Venus Optics Laowa 15mm stopped down 1 stop to f/2.8. When stopped down to f/2.8 the Laowa “flattens” out a lot for vignetting and uniformity of frame illumination. Corner aberrations also improve but are still present. I show those in close-up detail below. Above, I compare the vignetting of the three lenses, both wide open and when stopped down. Wide open, all the lenses, even the Sigma and Rokinon despite their large front elements, show quite a bit of drop off in illumination at the corners. 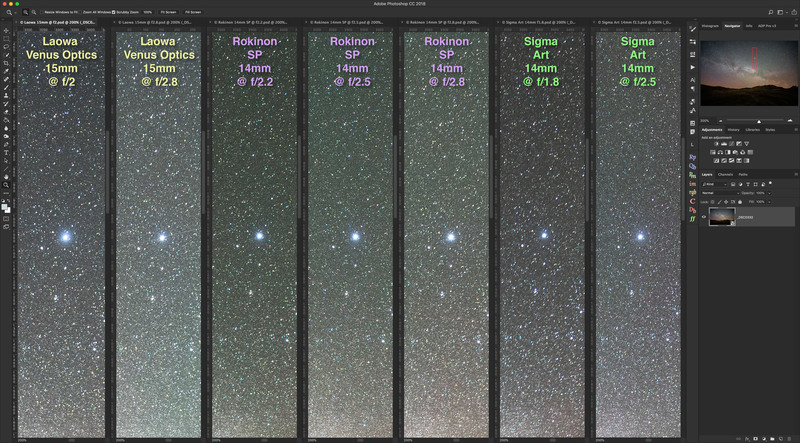 The Rokinon SP actually seems to be the worst of the trio, showing some residual vignetting even at f/2.8, while it is reduced significantly in the Laowa and Sigma lenses. Oddly, the Rokinon SP, even though it is labeled as f/2.4, seemed to open to f/2.2, at least as indicated by the aperture metadata. Above I show lens sharpness on-axis, both wide open and stopped down, to check for spherical and chromatic aberrations with the bright blue star Vega centered. The red box in the Navigator window at top right indicates what portion of the frame I am showing, at 200% magnification in Photoshop. 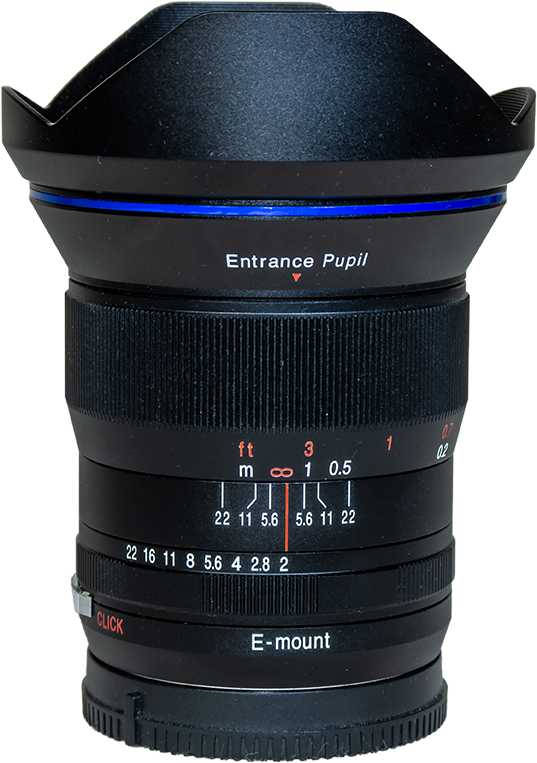 On-axis, the Venus Optics 15mm shows stars just as sharply as the premium Sigma and Rokinon lenses, with no sign of blurring spherical aberration nor coloured haloes from chromatic aberration. Focusing is precise and easy to achieve with the Sony on Live View. My unit reaches sharpest focus on stars with the lens set just shy of the middle of the infinity symbol. This is consistent and allows me to preset focus just by dialing the focus ring, handy for shooting auroras at -35° C, when I prefer to minimize fussing with camera settings, thank you very much! The Laowa and Sigma lenses show similar levels of off-axis coma and astigmatism, with the Laowa exhibiting slightly more lateral chromatic aberration than the Sigma. Both improve a lot when stopped down one stop, but aberrations are still present though to a lesser degree. However, I find that the Laowa 15mm performs as well as the Sigma 14mm Art for star quality on- and off-axis. And that’s a high standard to match. The Rokinon SP is the worst of the trio, showing significant elongation of off-axis star images (they look like lines aimed at the frame centre), likely due to astigmatism. With the 14mm SP, this aberration was still present at f/2.8, and was worse at the upper right corner than at the upper left corner, an indication to me that even the premium Rokinon SP lens exhibits slight lens de-centering, an issue users have often found with other Rokinon lenses. This is a stack of 8 x 2-minute exposures with the Venus Optics Laowa 15mm lens at f/2 and Sony a7III at ISO 800, on the Sky-Watcher Star Adventurer tracker. A single exposure taken through the Kenko Softon A filter layered in with Lighten mode adds the star glows, though exaggerates the lens distortion on the bright stars. This is a stack of 12 exposures for the ground, mean combined to smooth noise, and one exposure for the sky, all 30 seconds at f/2 with the Laowa 15mm lens on the Sony a7III camera at ISO 6400. 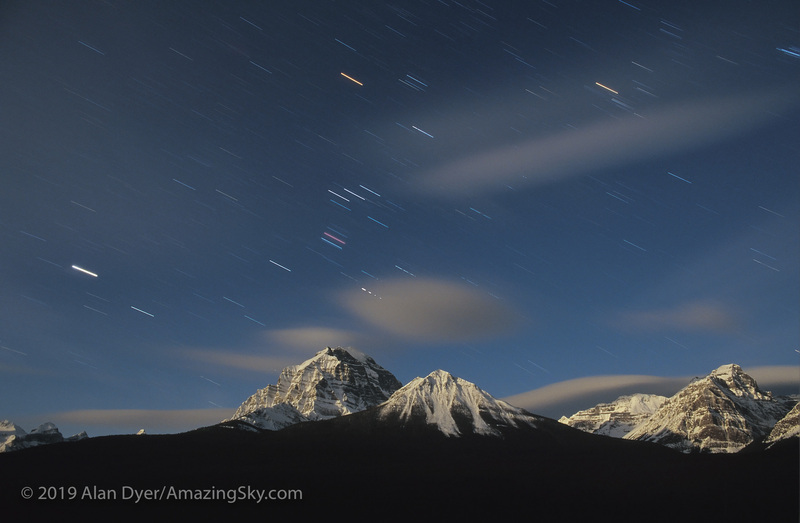 These were the last frames in a 340-frame time-lapse sequence. The fast speed of the Laowa 15mm is ideal for shooting tracked wide-field images of the Milky Way, and untracked camera-on-tripod nightscapes and time-lapses of the Milky Way. Image aberrations are very acceptable at f/2, a speed that allows shutter speed and ISO to be kept lower for minimal star trailing and noise while ensuring a well-exposed frame. 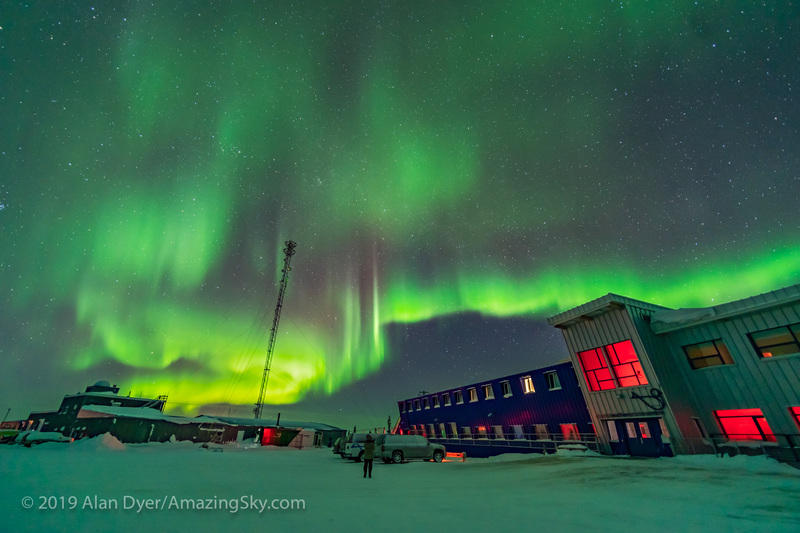 Aurora over the Churchill Northern Studies Centre, Churchill, Manitoba. This is 6 seconds at f/2 with the 15mm Venus Optic lens and Sony a7III at ISO 3200. 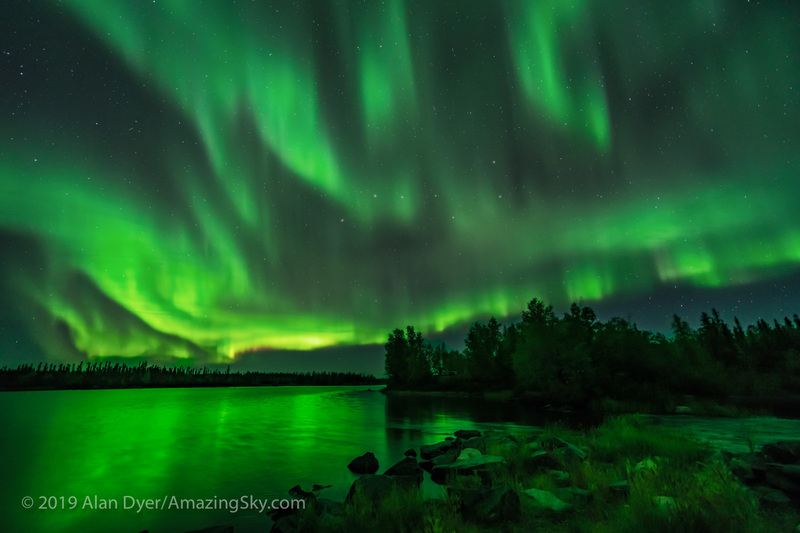 Aurora from near Yellowknife, NWT, September 8, 2018. This is 2.5-seconds at f/2 with the Venus Optics 15mm lens and Sony a7IIII at ISO 3200. The Northern Lights from at sea when leaving the Lofoten Islands, Norway heading toward the mainlaind, from Stamsund to Bodo, March 3, 2019. This was from the Hurtigruten ship the ms Trollfjord. This is a single 1-second exposure for at f/2 with the 15mm Venus Optics lens and Sony a7III at ISO 6400. Where the Laowa 15mm really shines is for auroras. 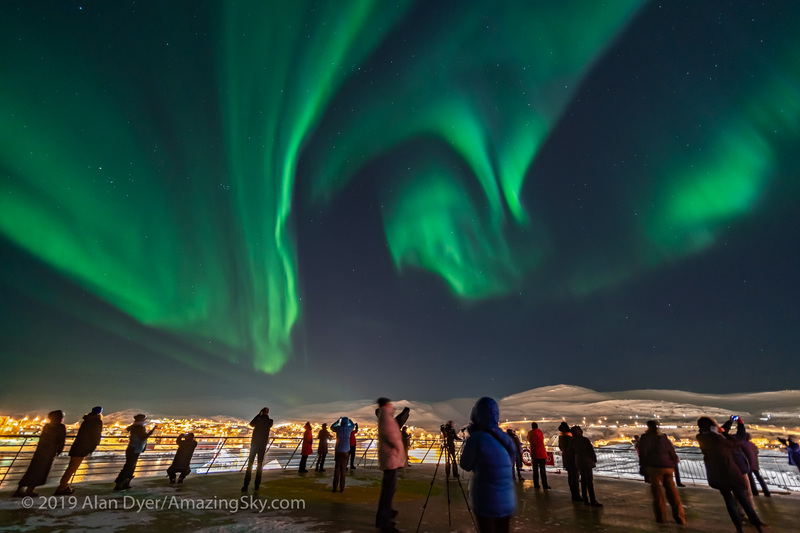 On my trips to chase the Northern Lights I often take nothing but the Sony-Laowa pair, to keep weight and size down. Above is an example, taken from a moving ship off the coast of Norway. The fast f/2 speed (I wish it were even faster!) makes it possible to capture the Lights in only 1- or 2-second exposures, albeit at ISO 6400. But the fast shutter speed is needed for minimizing ship movement. The Sony also excels at real-time 4K video, able to shoot at ISO 12,800 to 51,200 without excessive noise. 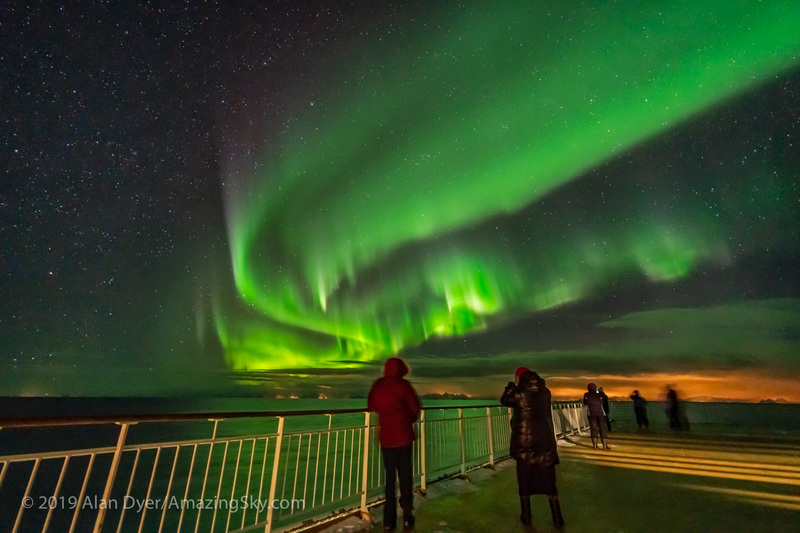 Examples of my aurora videos shot with the Sony and Venus Optics 15mm lens are in previous blogs from Yellowknife, NWT in September 2018, from Churchill, Manitoba in February 2019, and from at sea in Norway in March 2019. 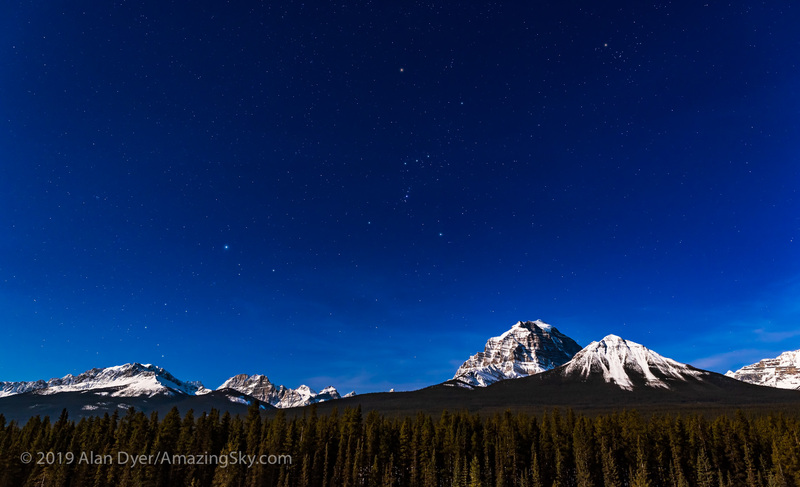 Click through to see the posts and the videos shot with the Venus Optics 15mm. 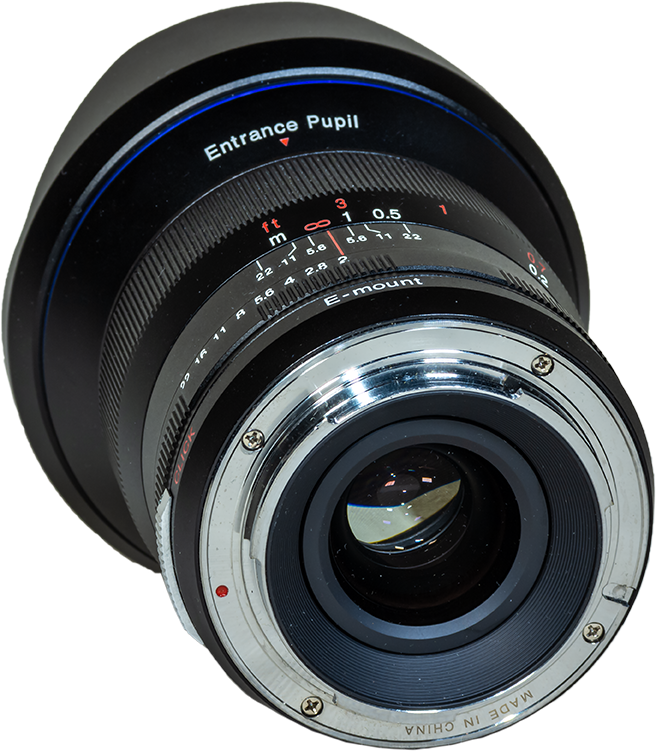 As an aid to video use, the aperture ring of the Venus Optics 15mm can be “de-clicked” at the flick of a switch, allowing users to smoothly adjust the iris during shooting, avoiding audible clicks and jumps in brightness. That’s a very nice feature indeed. In all, I can recommend the Venus Optics Laowa 15mm lens as a great match to Sony mirrorless cameras (it is not available for other lens mounts), for nightscape still and video shooting. 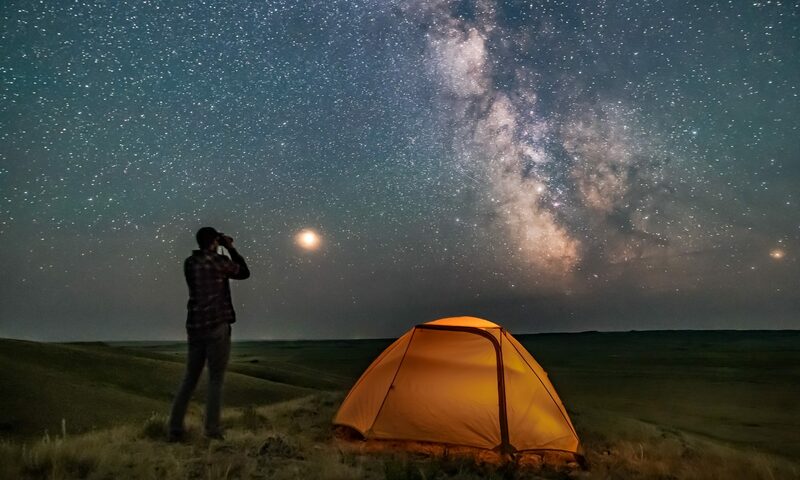 There’s a slogan used in the U.S. National Parks that “half the Park is after dark.” It is certainly true at Dinosaur Provincial Park in Alberta. Last Friday night, March 29, I spent the evening at one of my favourite nightscape sites, Dinosaur Provincial Park, about an hour’s drive east of my home. 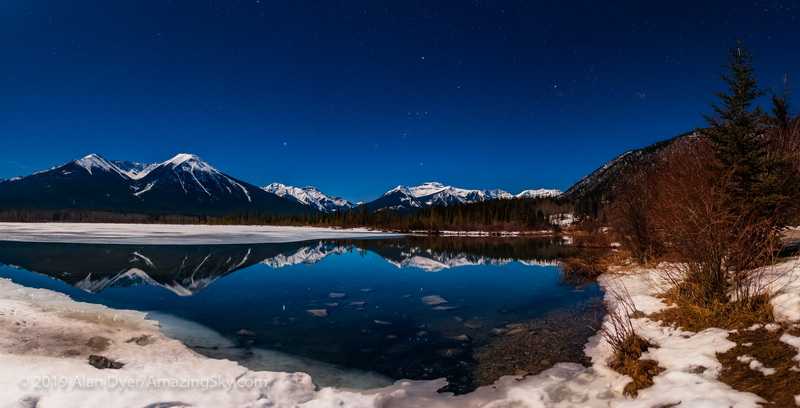 It was one of those magical nights – clear, mild, dry, and no mosquitoes! Yet! I wanted to shoot Orion and the photogenic winter sky setting into the evening twilight over the Badlands landscape. This was the last moonless weekend to do so. I shot some individual images (such as above) and also multi-panel panoramas, created by shooting a series of overlapping images at equal spacings, then stitching them later at the computer. This is a 240° panorama stitched from 17 segments, all with the 24mm Sigma Art lens and Nikon D750 in portrait orientation, each segment 20 seconds at f/1.4 and ISO 3200. Stitched with Adobe Camera Raw. There’s a narrow window of time between twilight and full darkness when the Milky Way shows up well but the western sky still has a lingering blue glow. This window occurs after the normal “blue hour” favoured by photographers. The panorama above shows the arch of the winter Milky Way but also the towering band of the Zodiacal Light rising out of the twilight and distant yellow glow of Calgary. Zodiacal Light is sunlight scattering off meteoric and cometary dust orbiting in the inner solar system, so this is a phenomenon in space not in our atmosphere. However, the narrow streak is an aircraft contrail. A 360° panorama of the spring sky over the Badlands of Dinosaur Provincial Park, Alberta. 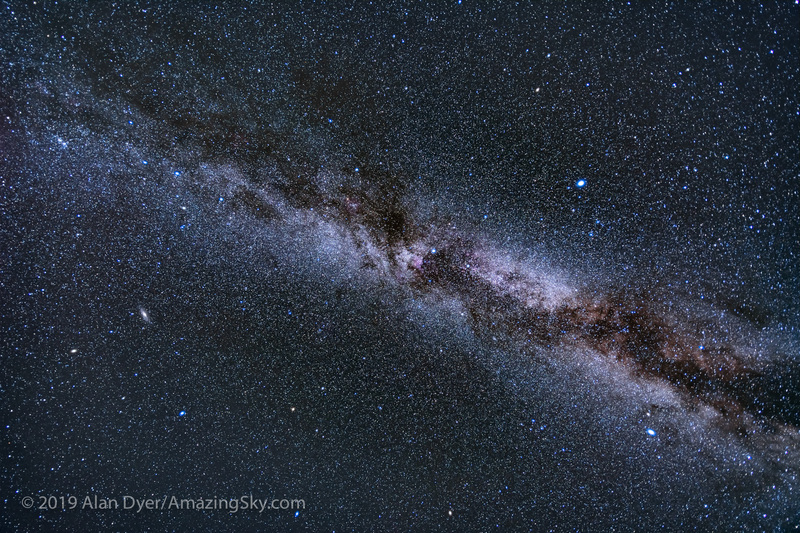 This is a panorama of 12 segments taken with the 14mm Sigma Art lens and Nikon D750 in portrait orientation, all for 30 seconds at f/2.8 and ISO 4000. Taken at 30° spacings. Stitched with PTGui. Later that night, when the sky was fully dark I shot this complete panorama showing not only the Milky Way and Zodiacal Light to the west, but also the faint arc of the Zodiacal Band continuing on from the pyramid-shaped Zodiacal Light over into the east, where it brightens into the subtle glow of Gegenschein. This is caused by sunlight reflecting off interplanetary dust particles in the direction opposite the Sun. Both the Band and Gegenschein were visible to the naked eye, but only if you knew what to look for, and have a very dark sky. This is a panorama stitched from 3 segments, all with the 24mm Sigma Art lens and Nikon D750, for 20 seconds at f/2.2 and ISO 4000. Stitched with Adobe Camera Raw. A closeup shows the Zodiacal Light in the west as the subtle blue glow tapering toward the top as it meets the Milky Way. It takes a dark site to see these subtle glows. Dinosaur Park is not an official Dark Sky Preserve but certainly deserves to be. Now if we could only get Calgary, Brooks and Bassano to turn down and shield their lights! 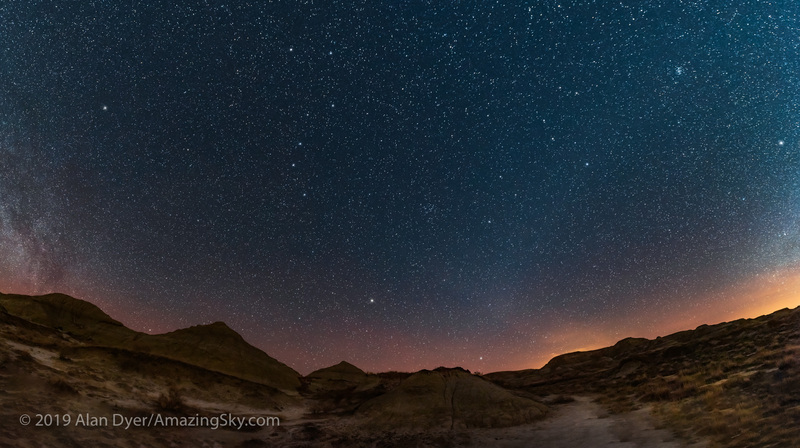 A 180° panorama of the spring sky and constellations rising in the east over the Badlands of Dinosaur Provincial Park, Alberta on March 29, 2019. This is a stitch of 6 segments, each with the 14mm Sigma Art lens and Nikon D750 in portrait mode, each 30 seconds at f/2.8 and ISO 4000. Stitched with PTGui. Leo is at right of centre, flanked by the Beehive and Coma Berenices star clusters. 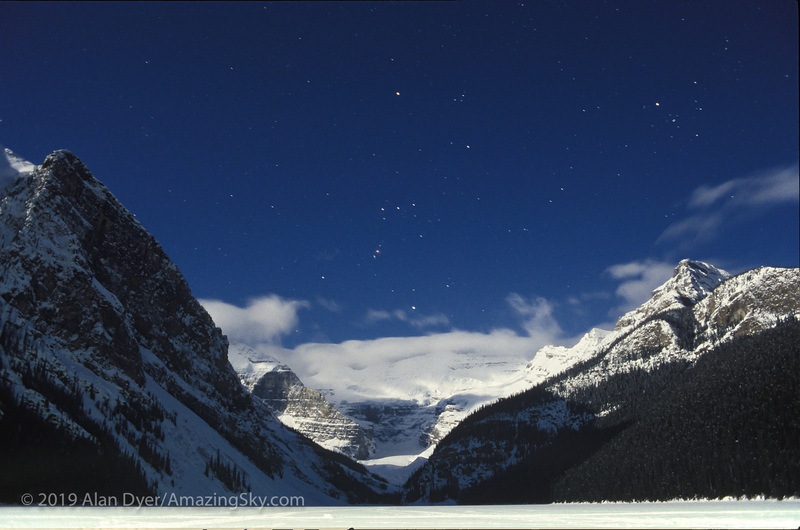 Polaris is at left — however, the distortion introduced by the panorama stitching at high altitudes stretches out the sky at the top of the frame, so the Dipper’s Pointer stars do not point in a straight line to Polaris. The faint Zodiacal Band is visible at right, brightening toward the horizon in the Gegenschein. I shoot images like these for use as illustrations in future eBook projects about stargazing and the wonders of the night sky. Several are in the works! I present a tour of the deep-sky wonders of the winter sky. 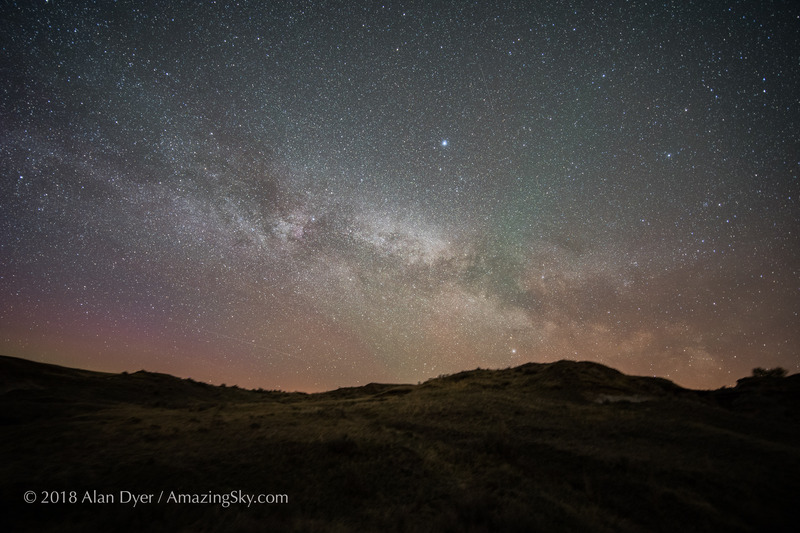 While some might think the Milky Way is only a summer sight, the winter Milky Way is well worth a look! In January and February we are looking outward from our location in the Milky Way, toward the Orion Spur, the minor spiral arm we live in. In it, and in the major Perseus Arm that lies beyond, lie hotbeds of star formation. These star forming areas create a panorama of star clusters and glowing nebulas along the winter Milky Way and surrounding the constellation of Orion. The montage above shows the best of the deep-sky sights at this time or year. The closeups below are all with a 200mm telephoto lens providing a field of view similar to that of binoculars. However, most of these nebulas are photographic targets only. This is a stack of 16 x 2- to 3-minute exposures with the filter-modified Canon 5D MkII at ISO 800 to 1250 and 200mm Canon L-Series lens at f/2.8. Taken with the Fornax Lightrack tracker as part of testing. Taken from home on January 8, 2019 during a clear couple of hours between passing haze and cloud. This is the heart of the star formation activity, in the centre of Orion. The bright Orion Nebula (or Messier 42 and 43) at bottom in Orion’s Sword is obvious in binoculars and glorious in a small telescope. The Horsehead Nebula above centre and just below Orion’s Belt is famous but is a tough target to see through even a large telescope. Barnard’s Loop at left is a wave of nebulosity being blown out of the Orion area by strong stellar winds. Any sighting of this object by eye is considered a feat of observing skill! The area of the Rosette Nebula (bottom) and Christmas Tree Cluster (top) in Monoceros with the Fornax Lightrack tracker and 200mm lens and filter modified Canon 5D MkII. This is a stack of 10 x 3 minute exposures at ISO 800. The small cluster of hot young stars inside the Rosette Nebula is blowing a hole in the nebula giving it its Rosette name. Above is a loose star cluster called the Christmas Tree, surrounded by more faint nebulosity that includes the tiny Cone Nebula. This is a stack of 10 x 3-minute exposures with the filter-modified Canon 5D MkII at ISO 800 and 200mm Canon L-Series lens at f/2.8. Some light haze passing through in some exposures added the natural star glows. I left those in as part of the stack to add the glows. Taken with the Fornax Lightrack tracker as part of testing. Taken from home on a rare fine and mild winter night, January 4, 2019. This field of clusters and nebulosity is above Orion in Gemini, with Messier 35 the main open star cluster here at top. Below M35 is the tiny star cluster NGC 2158. The nebulosity at left between Mu and Eta Geminorum is IC 443, a remnant of a supernova explosion, and is aka the Jellyfish Nebula. The nebula at bottom is IC 2174, just over the border in Orion and aka the Monkeyhead Nebula. This is a stack of 5 x 3-minute exposures with the filter-modified Canon 5D MkII at ISO 800 and 200mm Canon L-Series lens at f/2.8. Taken with the Fornax Lightrack tracker as part of testing. Diffraction spikes added with Astronomy Tools actions. Taken from home on January 4, 2019. Above Gemini and Orion lies Auriga, with its rich field of clusters and nebulosity, with — from left to right — Messier 37, Messier 36, and Messier 38, as the main open star clusters here. Below M38 is NGC 1907. The nebulosity at right is IC 410 and IC 405, the Flaming Star Nebula. In between them is the colourful asterism known as the Little Fish. Messier 38 is also known as the Starfish Cluster while Messier 36 is called the Pinwheel Cluster. The bright red nebula at top is Sharpless 2-235. The little nebulas at centre are NGC 1931 and IC 417. This is a stack of 5 x 3-minute exposures with the filter-modified Canon 5D MkII at ISO 800 and 200mm Canon L-Series lens at f/2.8. An additional exposure taken through the Kenko Softon A filter is layered in to add the star glows to bring out their colours. Taken with the Fornax Lightrack tracker. Taken from home on a rare fine and mild winter night, January 4, 2019. Now we enter Perseus, more an autumn constellation but well up through most of the winter months. It contains the aptly named California Nebula, NGC 1499, at top left, with the bright star Zeta Persei. at bottom A small region of reflection nebulosity, IC 348, surrounds the star Atik, or Omicron Persei, at bottom right. The star just below NGC 1499 is Menkib, or Xi Persei, and is likely energizing the nebula. The Pleiades with the Fornax Lightrack tracker and 200mm lens + Canon 5D MkII in a stack of 10 x 3 minute exposures at ISO 800. Obvious to the eye and central to the sky lore of many cultures is the Pleiades, aka the Seven Sisters, in Taurus the bull. It is also called Messier 45. This is a newly formed cluster of hundreds of stars, passing through a dusty region of the Milky Way, which adds the fuzzy glows around the stars — an example of a reflection nebula, glowing blue as it reflects the blue light of the young stars. 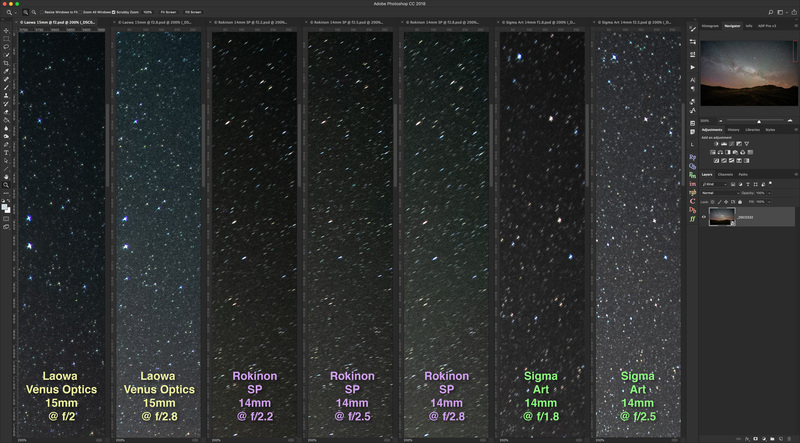 This is a stack of 5 x 2-minute exposures with the Canon 5D MkII at ISO 800 and 200mm Canon L-Series lens at f/2.8. An additional exposure taken through the Kenko Softon A filter is layered in to add the star glows to bring out their colours. Taken with the Fornax Lightrack tracker. Diffraction spikes added with Astronomy Tools actions for artistic effect. Below the Pleiades in Taurus lies the larger Hyades star cluster. The V-shaped cluster stars are all moving together and lie about 150 light years away. Bright yellow Aldebaran, the eye of Taurus, is an intruder and lies at only half that distance, so is not a member of Hyades but is a more nearby star. The smaller, more distant star cluster NGC 1647 appears at left. This is a stack of 10 x 3 minute exposures at ISO 800 (with the filter-modified Canon 5D MkII and Canon 200mm lens at f/2.8). The rings of colour around Sirius are an artifact of the sensor filter, I think! Low in my northern winter sky is the brightest star in the sky of any season, Sirius. Just above and to the east of Sirius lies the Seagull Nebula (at top left), also called IC 2177, on the Canis Major-Monoceros border. Like many of these nebulas. the Seagull is too faint to easily see even with a telescope, but shows up well in photographs. With the Fornax Lightrack tracker and 200mm lens and filter-modified Canon 5D MkII. A stack of 10 x 3 minute exposures at ISO 800 with the filter-modified Canon 5D MkII and Canon 200mm lens at f/2.8. This is the head of Orion, with the red supergiant star Betelgeuse at bottom left and the blue giant star Bellatrix right at bottom right. The brightest star at top is Meissa or Lambda Orionis, and is surrounded by a large and very faint area of hydrogen nebulosity. The open cluster around Meissa is catalogued as Collinder 69. While the winter Milky Way might not look as bright and spectacular as the summer Milky Way of Sagittarius and Scorpius, it does contains a wealth of wonders that are treats for the eye and telescope … and for the camera. PS. 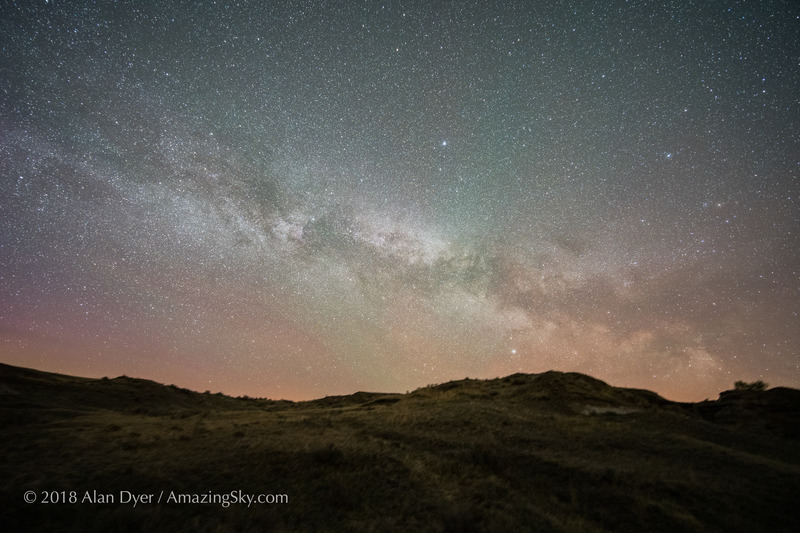 : The techniques for taking and processing images like these form the content of our new Deep Sky with Your DSLR video course now being promoted on KickStarter until the end of February, and available for purchase once it is published later this spring. See my previous blog post for details. Thanks and clear skies!